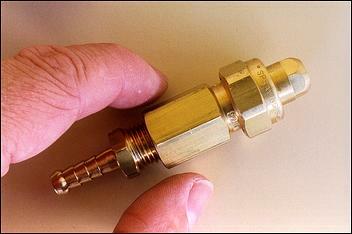 A module that can be used to control a water injection system or an intercooler water spray. By building this module you can automatically vary the flow of a water injection so that it rises with engine load. Alternatively, you can use it to control when an intercooler water spray switches on (and then how much water it flows!). A few weeks ago we covered how to build the Motor Speed Control - if you are reading this article without having first read that one, go read Part 1! And in Part 2 - last week - we covered a minor modification to the control module that allowed it to accept the input from a MAP sensor or engine airflow meter, giving it the capability to vary the speed of a pump or fan with engine load. Again, it makes a lot of sense to read that story before continuing here. Those module modifications were designed to work with a device that would always be running - the water pump in a water/air intercooling system, for example. You don't want it to stop, just because you're idling in traffic. (Or, more accurately, you wouldn't want it to stop for an extended period if you're stuck in a traffic jam, anyway!) The same applies to an intercooler fan drawing air through a 'cooler that's tucked out of the way - eg at the back of a Toyota MR2. Again in this situation, you don't want the fan to actually stop when the engine is idling. The above approach kept the pump or fan running all of the time, but there are lots of applications where you do want the pump or fan to turn right off at light engine loads. Probably the best example is of a water injection system - that's the one designed to ward off detonation. (For those who don't know about water injection, you'll find lots of background in "Water Injection") If you've got a water injection spray nozzle directed into the intake, you want it to stay switched right off until you'll pulling high horsepower - that is, until there's plenty of airflow and also plenty of cylinder pressure. It's pretty important that the amount of water being added to the intake air also varies with load - otherwise you get in a situation where the amount of water per cfm of air being breathed by the engine actually decreases as the load goes up! (That is, the same amount of water is being mixed with more air.) In fact, some commercial water injection kits do just this - at a certain boost pressure, a pump switches on and that's that. 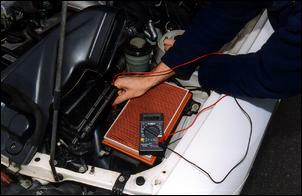 Or, if you decide to use this module to control an intercooler water spray, the same basic idea applies. You want the spray to come on only at high engine loads (eg when coming onto boost) and it's also useful if the amount of water flowing through the spray varies with engine load. Using this module to control an intercooler water spray is much cruder than the approach that we have covered in our Intelligent Intercooler Water Spray series, starting at "Intelligent Intercooler Water Spray, Part 1". For a high quality spray, we would strongly recommend that earlier approach - it will cool more efficiently and you will use far less water. However, the Intelligent Intercooler Water Spray Controller is also a more expensive product than the speed control module that we are covering here. And as we've said earlier in this series, building this module will probably cost you less than using even a simple adjustable boost pressure switch and relay! So in these types of applications we need to make a modification that allows the setting of the input signal voltage at which the pump will spring into action, with the pump staying off below that input signal voltage. If an airflow meter has an output signal that varies from (say) 1.8 volts at idle through to 4.5 volts at full load, we need to have a 'switch-on' adjustment that extends from (say) 0 - 4 volts. In other words, if the control was set so that the water injection pump didn't come on until the load signal reached 3 volts, that would correspond to a moderately heavy engine load. Because we believe that most people will use the module (modified in the way described here) for either water injection or intercooler water spray purposes, we decided to do the development using the pump, reservoir and nozzle parts that are stocked in the AutoSpeed Shop for the Intelligent Intercooler Water Spray. 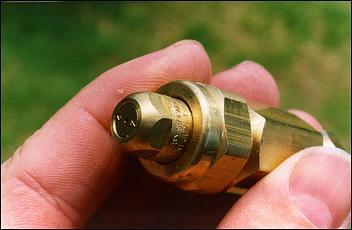 The nozzle is a very high quality Spraying System brass design, and comes complete with check valve (important to stop the nozzle dripping) and in-built filter. We need to stress that the quality of the spray that you get from a nozzle is all-important in determining how well the water injection process (or intercooler cooling process) actually occurs. This is even more the case when the flow through the nozzle is being varied. We don't think that a variable volume spray will work very well with cheap nozzles. They tend to just dribble - rather that forming small droplets - when the water volume is reduced. 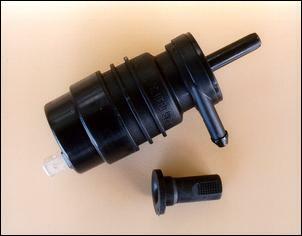 The pump is a high pressure VDO windscreen washer pump - and again, not all pumps are the same. Others that may look very similar do not necessarily have the required flow or pressure. 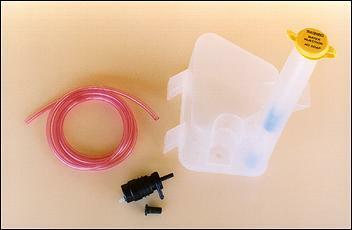 We highly recommend that any water spray system that you build uses this pump and nozzle combination. The AutoSpeed shop also sells the reservoir that's pictured here - if it can be conveniently be fitted inside an inner guard (the neck protruding through a hole) or can be mounted elsewhere, then buy it. The pump clips straight into a recess on the bottle. 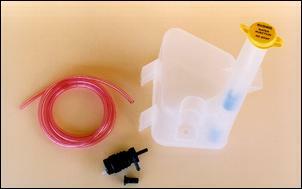 However, the pump can be easily fed in other ways - the reservoir is not nearly as important as the nozzle and pump! All the test results that are shown here (pump flows, switch-on points, etc) were gained using the VDO pump and Spraying Systems nozzle, with the battery voltage regulated at 13.8 volts (ie typical running car voltage). Again to stress the point - how well other pumps and/or nozzles will work could vary all over the place! Modifying the module to allow a variable switch-on voltage requires only three changes. You'll need a new 100 kilo-ohm potentiometer and a 100 kilo-ohm resistor. As with all these module modifications, both components can be bought from an electronics shop for just a few dollars. 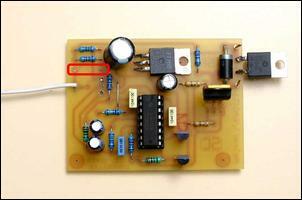 Remove the 5K trimpot that is on the printed circuit board. If you use a solder sucker, it's fairly easy to unsolder this component. 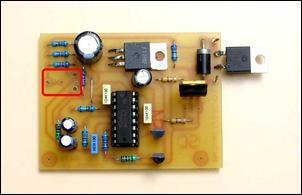 With it off and the board orientated as in this diagram, you'll see a triangular array of blank spots where the legs of the trimpot were previously soldered. As shown here, the 0-5 volt input signal wire connects to what was previously the wiper arm terminal of the trimpot. Remove the 47 kilo-ohm resistor that was nearest the (now missing!) trimpot. 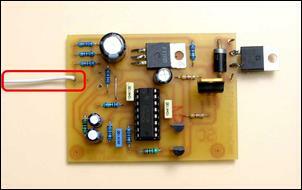 Remove the 18 kilo-ohm resistor from the board. Connect the new 100 kilo-ohm pot in its place, wired as is shown here. Those are the only modifications required. 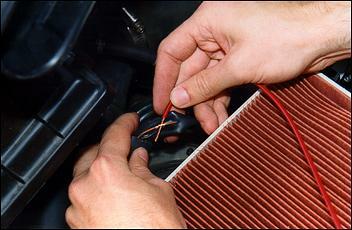 The load signal can be derived from either the MAP sensor or airflow meter, depending on which one your engine has. You can tap into its load output without worrying the car's ECU - the airflow meter or MAP sensor can simultaneously work with both the factory ECU and also this added module. Let's start off with an airflow meter. It's best if you have the workshop manual, but you should still be able to find the right wire even if you don't. You'll need your good quality digital multimeter, set to measure voltages. Earth one side of the meter then use the other (sharp) probe to carefully backprobe the airflow meter connector. Typically, you'll find 0 volts (meter earth), 5 volts (regulated power supply to the meter), and a voltage that varies as you rev the engine up and down. There will also be other connections for temperature outputs, so keep on probing until you find the right wire. Remove a short section of insulation from the signal output wire and solder a new wire to it, either at the meter itself or if you want to follow the colour codes (and have that workshop manual! ), back at the ECU itself. Run the new wire into the cabin and connect the multimeter to it and earth, so that the voltage output on this wire can be read off as the car is being driven. Use an assistant to read the meter. 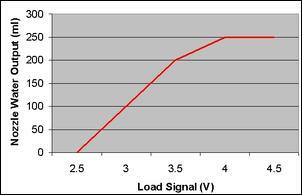 Confirm that the signal voltage does rise with increased load, and that it peaks at around 4 or 5 volts. Working with a MAP sensor is a similar process, except it's likely that the MAP sensor will only have three connections - power, earth and the signal output. But again backprobe the connector until you find the wire that has a voltage that varies with engine load. Note that some airflow meters and MAP sensors have frequency outputs, rather than varying voltages. 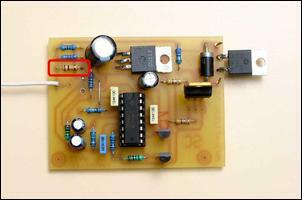 This module will not work with frequency output sensors. 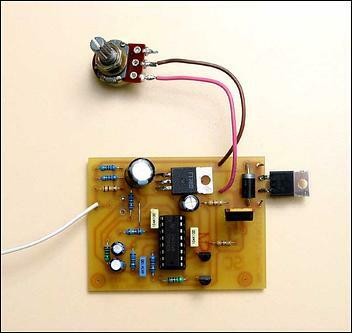 In this example I have used a water pump, but instead you could use an electric fan - or even just a 12-volt warning light, whose brightness will vary with the different voltages coming out of the module. 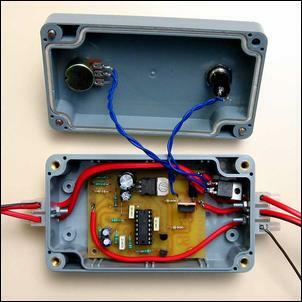 Connect the pump to the module's outputs, connect earth and 12V, and connect the airflow meter or MAP sensor signal to the module, all as described above. Rev the engine, so that the load being measured by the MAP sensor of airflow meter suddenly increases. Check that the pump starts when the load rises, and then continues to get faster and faster at higher loads. Back at engine idle the pump should again switch off. Note that as with all pumps, you shouldn't run it dry. In fact, that's the easiest way of regarding the pot - as a sensitivity setting. At one end of its rotation the spray is on all of the time; at the other end it will only operate at very high engine loads (if it comes on at all!). But what sorts of flows occur with this pump, nozzle and electronic module? Set so that the pump is completely off with a load signal input of 2V (which would be a fairly typical application), the nozzle flows as shown by this graph. There are a few important points here. The pump is very sensitive to voltage variations - great, just what we want! If you set the module pot so that the pump is completely dead with an airflow meter input of 2 volts, then it will not start to pump an appreciable amount until the module input gets to 2.5 volts. (Note that it will start humming a bit before that, but it won't be actually pumping much.) Then as the engine load voltage rises, it pumps 100 ml/minute with an input to the module of 3 volts, and rises to 200 ml/minute at 3.5 volts signal input. By the time the input voltage reaches 4 volts, it's pumping at its max output of 250 ml/minute. So a quarter of a litre per minute is the max that you can expect the system to flow. In a water injection application, that is a lot of water! In fact, there will be many uses of this system where you want less water to flow. The easiest way of achieving this adjustment is to put a simple ball valve in-line with the nozzle. That is, an adjustable tap that can restrict flow. 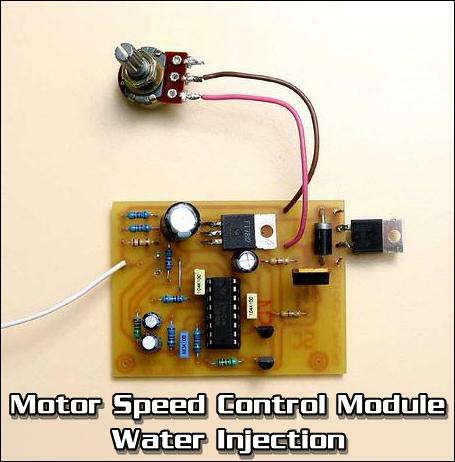 With some simple mods, the motor speed controller kit can be used to control a water injection or intercooler water spray pump, to vary the pump speed in a water/air intercooling system or the speed of a fan drawing air through an air/air intercooler. In as-built form it can provide manual control over the speed of the ventilation fan and engine cooling fan.